The Supercans are Coming! 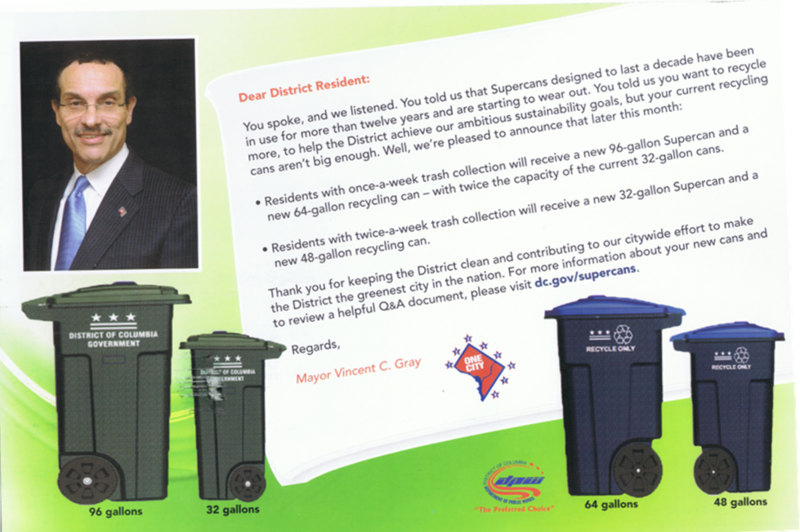 | Tenleytown, D.C.
Posted on February 11, 2014 by Tenleytown, D.C.
Tenleytown residents likely received a flyer like this one from the Department of Public Works and Mayor Vincent Gray this week letting them know that they would be receiving new Supercans and recycling cans. However, the colorful flyer was a bit light on the details of when and what to do with the old cans. DC residents, like those of us in Tenleytown, whose trash is picked up once a week will receive the new trash and recycling cans first, followed by those who receive twice weekly pick up. Ward 7 and 8 residents will be the first recipients, followed those whose trash is picked up on Thursdays, which includes most of our own Ward 3. Delivery of the new cans began this month, and all DC residents should have new trash and recycling cans by the end of July. Tenleytown residents will receive one 96 gallon Supercan, which is the same size as current cans, and one 64 gallon recycling can, which is double the capacity of current recycling cans. For those who want to get rid of their old trash and recycling bins, DPW will provide “Take Me” labels in the new Supercans that can be affixed to the front of the old, empty containers. Residents should then call 311 or 202-737-4404 to request removal of unwanted containers. Cans labeled for pick up should be placed where trash and recycling are normally collected. DPW will recycle any collected cans. If your current trash and/or recycling containers are in good shape and you want to continue using them, you may do so along with the new containers. And if they are in good shape, fully meet your needs and you don’t want a new Supercan and/or recycling can, you can affix a “Take Me” label to the new cans for DPW to retrieve them. If you choose to continue using your old trash and recycling cans, be aware that DPW will no longer repair the old containers. Only the new Supercans will be maintained. Still have questions? Visit dc.gov/supercans for additional information or call 202-645-4301.